Due to its magnetic capability, degaussing was first used to install electromagnetic coils into battleships during World War 2, however these days it is commonly used as a popular method for disposing of redundant I.T assets such as hard drives and floppy disks. Also used for tape media disposal, degaussing works by passing a powerful magnet over the magnetic tape to rearrange the particles polarity, which will distort the tape’s data until it becomes completely unreadable. Degaussing causes irreversible damage to the tape, deeming it completely un-reusable. Tape degaussing is an option for those who want to dispose of their data storage tapes and hard drives onsite, however it is important to consider that older degaussers may need to be regularly serviced, maintained and/or replaced with a newer model and as media densities increase, the stronger the degausser will need to be to ensure it is having an effective impact the tape data. Here at Insurgo we have collaborated with the global degausser manufacturer Proton Data Security, to ensure we can offer our customers a secure onsite degaussing method, if that is the disposal route in which they wish to pursue. 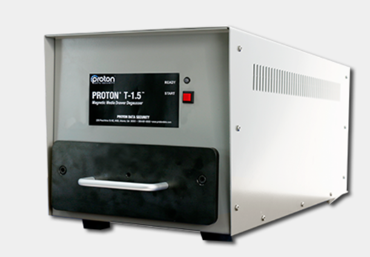 The Proton degaussing products all meet the requirements Department of Defence (DOD) and US National Security Agency (NSA). The T-1.5 is a fully automatic drawer style degausser with a cycle time of 3 seconds. This powerful commercial degausser produces at least 15,000 Gauss/1.5 Tesla for each cycle (there measurements indicate its magnetic flux density, to put that into perspective, a fridge magnet is about 100 gauss). This level of magnetic pull means the T-.15 degausser it will effectivity sanitize hard drives and tapes, your DLT, LTO, DDS, etc of all the terabytes of data stored on them and will remain effective magnetic media technology continues to advance. With its highly powered capacity, this compact unit will ensure your disposed data will be completely unrecoverable and ensure you remain in compliance with data security standards and data regulations including NIST and GDPR.